Mention the words “Denmark” and “metal” in the same sentence and the average headbanger will likely think of one of two artists; Volbeat or King Diamond. Maybe Hatesphere, Pretty Maids or Raunchy at a push. Or even a certain tennis player turned thrash drummer with a tendency to get up from his kit a lot. The Danes have contributed a lot to the world but let’s face it, they have a tendency to get overshadowed by the Germans or the Scandinavians. Hanging The Nihilist aren’t going to change that. The six-piece death metallers will be extremely lucky if they ever find themselves treading the boards at an arena show, but fans of pure guttural extremity will certainly enjoy their latest EP. 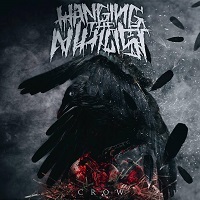 ‘Crow’ is five tracks of stomach churning, fist clenching brutality as violent as any American deathcore act you can name. It’s thoroughly uncommercial but it’s also a satisfying listen if you want metal music to remain as uncompromising and dark as possible. This is metal that’s been clawed from the dingiest clubs in Europe and left a trail of blood behind it. Guttural vocals, furious breakdowns and an almost machine-like commitment to pulverising rhythms work together to make an almost incomprehensible wall of noise. Ever seen that Youtube video of the TV reporter being splattered in the face by a watermelon shot from a slingshot? That’s this EP in musical form. Their one concession to accessibility though is actually their ace in the hole. Opening song ‘Abandoned’ kicks off with a haunting piano melody, but what you expect to be a brief introduction forms a key part of the song. The piano keeps playing, adding a Gothic tinge to the otherwise bull-headed aggression. It crops up again throughout the rest of the EP, the keys returning to change the atmosphere from ‘Fight Club’ to ‘Castlevania’ at some well-placed moments. It shouldn’t work, but it does. Picture Despised Icon but with everyone dressed as The Sisters Of Mercy and that’s the vibe it leaves you with. As it’s only an EP of course, ‘Crow’ is over reasonably quickly but there’s enough morsels here to savour until they get an album out. Whether they’ll manage to maintain such intensity over a full length remains to be seen, but for now they’ve got enough knuckledusters like ‘Filth’ to pique the underground’s interest and turn toilet venues into maelstroms of violence. Unless they do a Bring Me The Horizon-esque about face, ten years from now they’ll never headline Download, but that isn’t necessarily a bad thing. This is gnarly, in-your-face evil and while it won’t make Denmark into the new epicentre of metal, it still does what it sets out to do with twisted, malevolent relish. ‘Crow’ is out now. You can get your copy HERE.